MANILA, Philippines - With 2016 presidential elections nearing, netizens have found creative ways to endorse their candidates particularly on social media. This time, netizens tried to shift the focus to prospective first sons. Who among the prospective presidential sons gets your stamp of approval? A social media post featuring the sons of presidential candidates Senator Grace Poe, Davao City Mayor Rodrigo “Rody” Duterte, former DILG chief Manuel “Mar” Roxas III and vice president Jejomar “Jojo” Binay is now making rounds on the internet. Netizens were asked to vote by prospective first son. Based on a post by a certain Ian Rosales Casocot, Duterte’s 28-year-old son Sebastian/Baste emerged as the netizen’s “crush ng bayan.” Sporting tattoos and a lip ring, Baste’s bad boy charm certainly earned the votes of most netizens. A businessman, a musician and a surfer, Baste is a father to a 5-year-old girl and a 1-year-old boy. He has been living with the mother of his second child for about three years. Brian Poe Llamanzares, who recently made headlines because of a controversy involving his fake Nike McFly 2015 shoes, emerged as another favorite for his good boy appeal. The bedimpled 24-year-old son of Poe previously worked as a rookie reporter at CNN and earned the “Most Outstanding TV Reporter” award. He was previously linked to Kapamilya talent Myrtle Sarrosa and Kapatid actress Jasmine Smith. With his good looks, several netizens have tagged Roxas’ son Paolo Gerardo as a certified headturner. The 22-year-old child of Roxas with former girlfriend and 1971 Miss Young International Philippines winner Maricar Zaldarriaga served as his father’s best man during his wedding with Sanchez in 2009. On the other hand, it seems that vice presidential son and former Makati City mayor Jejomar “Junjun” Binay failed to attract netizens with his physical attributes. He was the mayor of Makati City from 2010 to 2015 before being dismissed for graft charges and falsification of documents over the construction of Makati City carpark building which amounted to P2.2 billion. 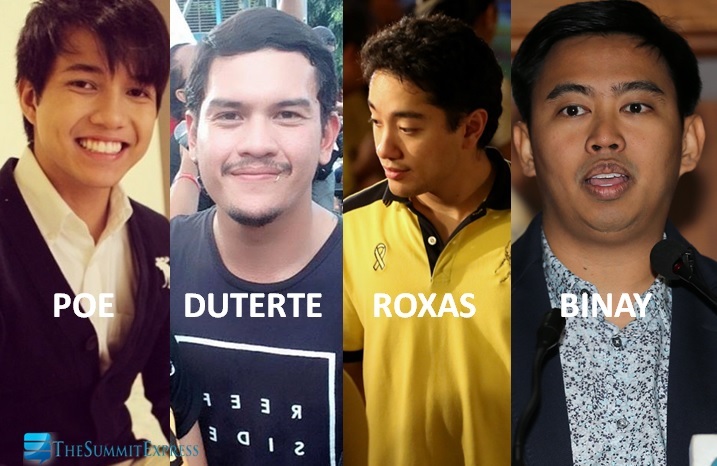 Check out netizen Rei Hontanar’s amusing take on prospective presidential sons.